Organize your home this year by creating the perfect places for all the things in to live. Are you working to organize your home and life in the new year? I started the year with my foot in a boot, recovering from a fractured metatarsal. That meant a lot of time sitting with m foot elevated. So I used the time to binge watch the new Netflix series Tidying Up with Marie Kondo. Have you watched it yet? After getting all the Christmas decorations put away, I started on organizing the rest of the home. I love adding in extra organization to start the year off. It’s a great feeling to start the year off right. One of my favorite things to do is to DIY things that we can use in our home and make it more organized. My husband says everything I make has to be 2 things, 1. Pretty and 2. Useful! So I gathered together a list of my favorite DIYs to organize your home. These 19 DIYs include amazing toy storage ideas, kitchen organizations projects, ways to organize your clothes, and more! All the things you need to get a fresh start whenever you need it. Storage boxes are my favorite way to organize our home. They can be used to pull together any things that needs a home, even if it is just that pile of clutter that tends to accumulate on the edge of the counter. But storage boxes can cost a lot! Instead of spending all my money on buying pretty boxes, I love to DIY them out of boxes on their way to the trash. If you need a collection of storage boxes, save boxes from the things you buy frequently. We buy our coffee k-cups at a warehouse store and the boxes they come in are the perfect size for organizing. I never throw them out, just repurpose them. 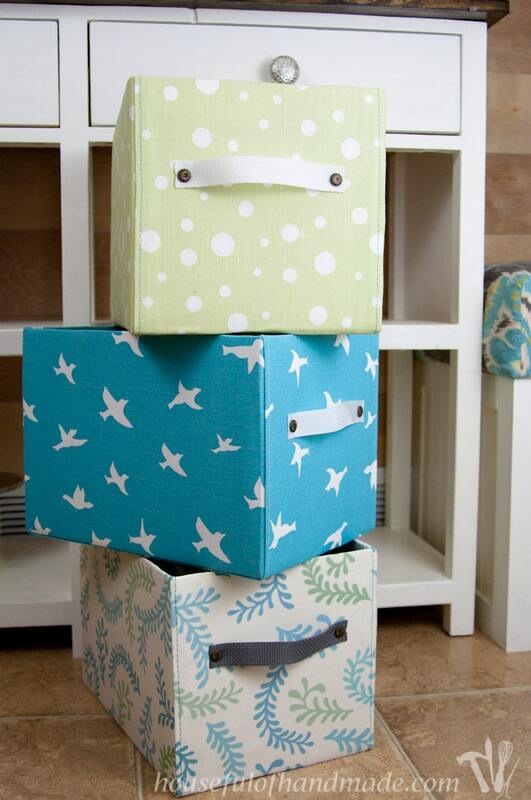 These easy DIY fabric storage boxes are the perfect solution for making those boring boxes into something beautiful! You will never believe how easy it is to turn something ready for the trash into something so useful. And I can attest to the ability of these boxes o hold up over time. We have been using our fabric covered storage boxes for 3 years and they still look great! Instead of buying fabric to cover your boxes, another option is to use inexpensive drop cloth. That is what I did for these easy drop cloth storage boxes I made for our closet. Drop cloth is inexpensive, but very sturdy. And I love the neutral color and fun texture it brings to a project. I don’t know about you, but my closet can easily become a dumping ground for all things I want to hide. The solution, a well organized closet! 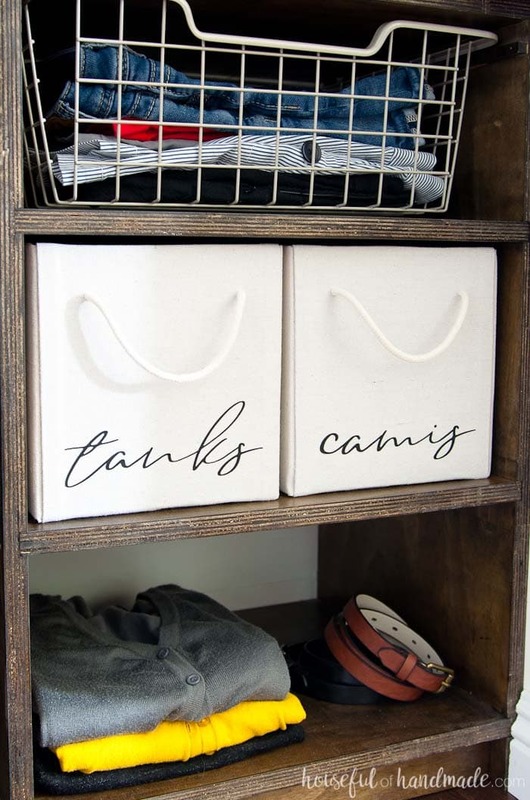 Whether you need better ways to organize your clothes, shoes or accessories, these DIYs will help you create a place for everything so everything can be in its place. Use every last bit of space in your closet by building these plywood closet organizers. You will be amazed at how much room you gain by adding shelves, drawers, and more. Even the smallest closet can become super organized and efficient. See how we updated our master bedroom closet for only $100 starting with these organizers. If you have a lot of shoes, but not a lot of room, why not store them on the wall? 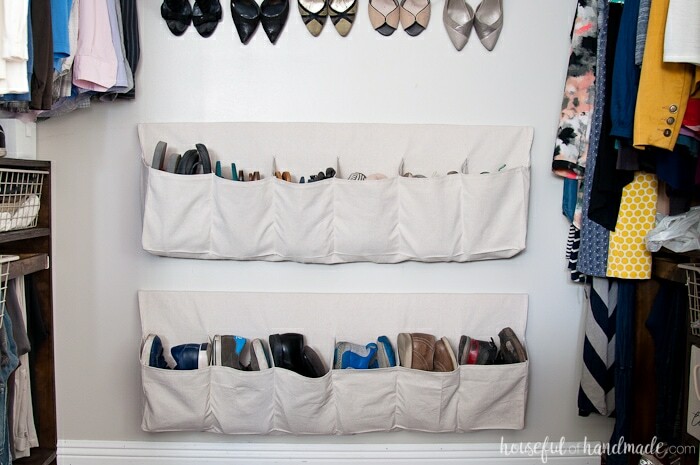 This hanging shoes storage is made from inexpensive drop cloth and takes up very little space. 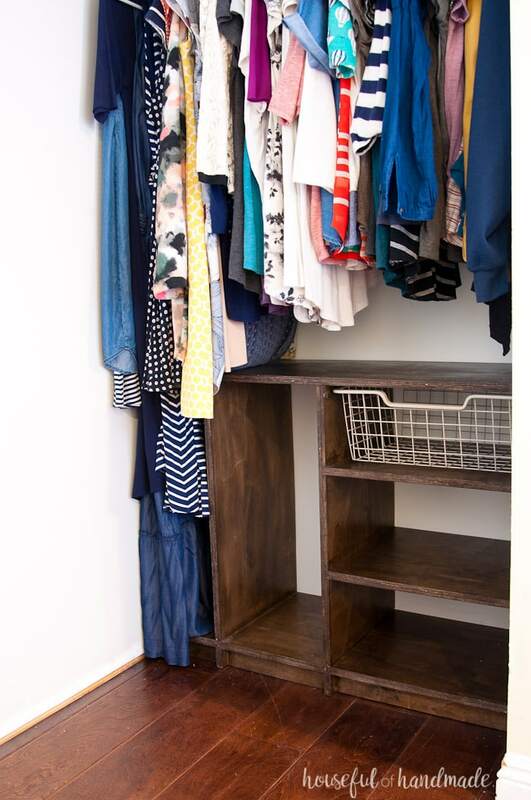 It was another amazing budget friendly project from our $100 closet makeover. If you love jewelry, you know how hard it can be to organize it all. This wall jewelry organizer has room to organize necklaces, earring, bracelets and more! But even better, it sits inside your wall (think old school medicine cabinet) so uses up space that you will never miss. At the same time creating art for your room. Just have a few pieces of jewelry? 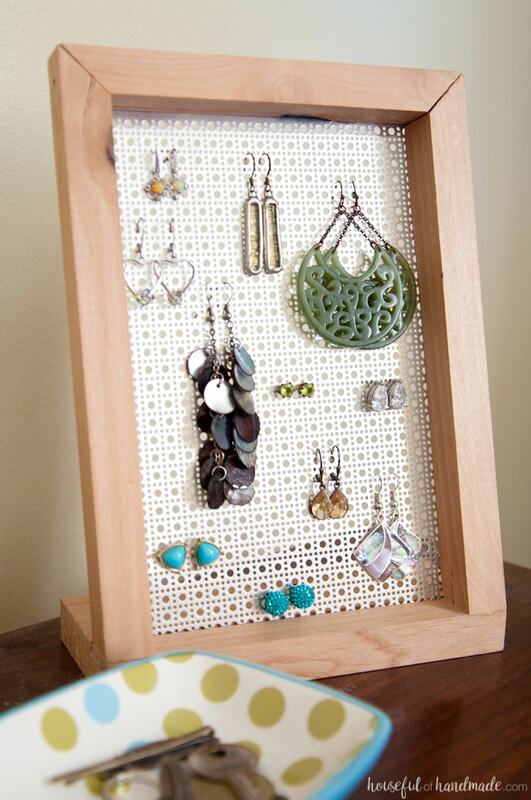 Why not make this easy DIY earring stand. It’s the perfect solution to hold any type of earring and can sit on your dresser or bathroom counters. Also makes a wonderful way to organize earring for little girls. If laundry is your least favorite chore (I know it is mine! ), then creating an organized laundry room should be at the top of your to-do list. After redoing our laundry room for only $100, the whole process was a little more bearable. This stackable laundry basket storage is the perfect place for all the clothes to be sorted and stored while waiting for their turn in the wash. It keeps the laundry baskets organized and out of the hallway. 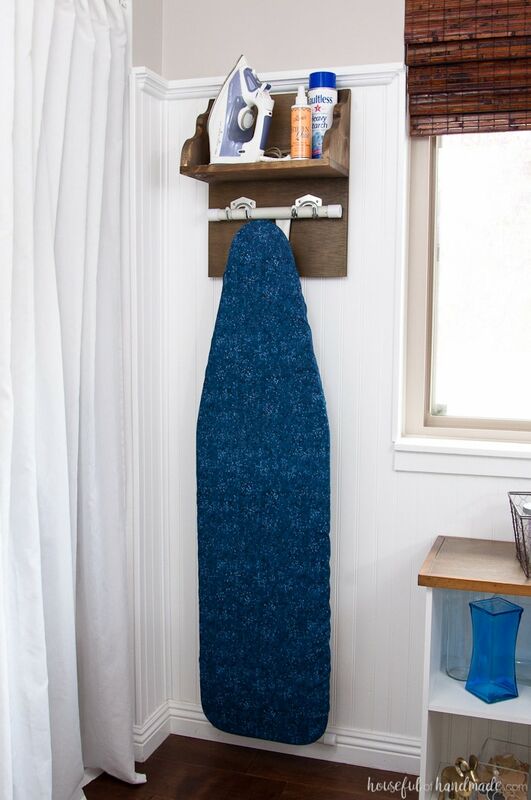 Perfect for any small laundry room. But my favorite part of the new stackable laundry basket storage is that the kids can easily sort their own clothes. I never realized how much an iron holder with ironing board storage would impact me. Before, the ironing board was stored next to the dryer and the iron was wherever I had previously left it. Now they both have a home and can be found quickly when needed. And even though I don’t actually store our iron in the laundry room (I keep it in my craft room for quick access when sewing), having a home for it does bring me joy. Kitchens are the heart of the home so keeping them organized is a must! These easy DIYs will help you stay a little saner in the kitchen while also making it a little prettier in the process! If you love to cook, you know how hard it is to store all your favorite spices. I hated them in the cupboard because they were hard to find. Now they are all out on display and organized! 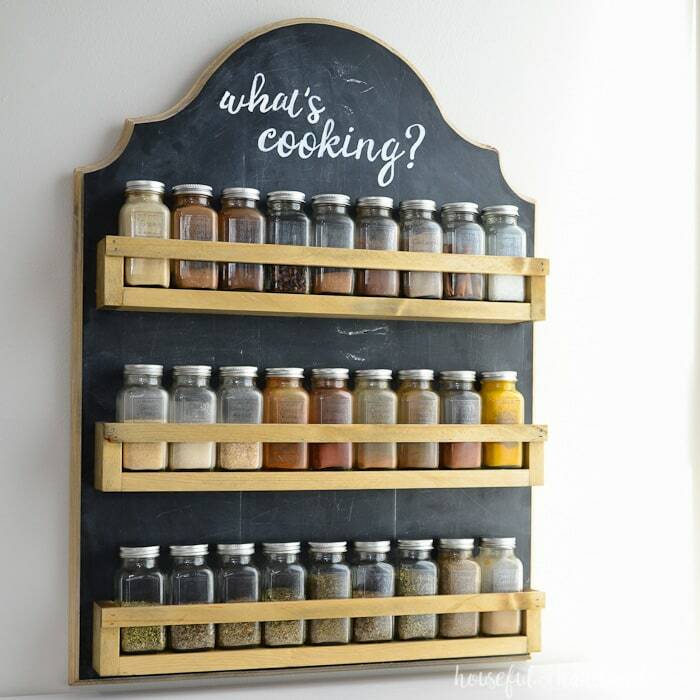 This wooden spice rack is the perfect afternoon build project to get your kitchen organized this year. And it doubles as art on your walls because it’s so pretty! Never having to search around for my kitchen utensils again has been the best decision I ever made! These kitchen drawer organizers were made out of scraps of wood. 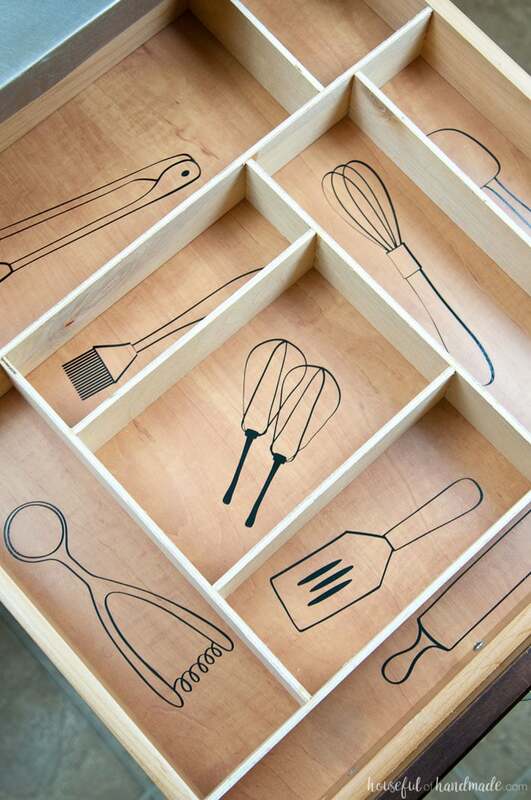 They keep the utensils organized, but then we added drawings of kitchen utensils out of vinyl. Now no matter who cleans out the dishwasher… things go in the right spot! Have an extra wall in your dining room? 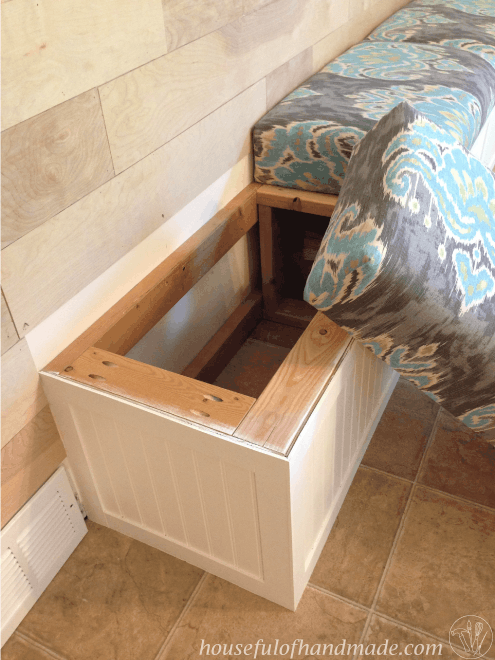 Why not make a built in bench with loads of storage? We love using our hidden storage for items we do not use often but cannot part with. And we love the extra seating for guests too! Even though bathrooms come with their own cupboards and drawers (hopefully), sometimes you need a little more organization. Simple solutions can make your bathroom more organized. 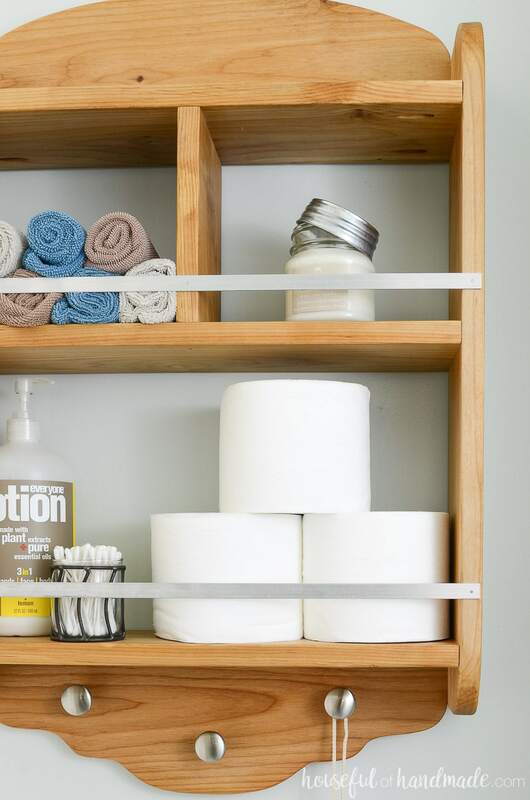 These simple bathroom storage shelves are the perfect way to add a little more storage to your bathroom. Hang them above the toilet to keep all the necessities at hand. And these storage shelves can be built with basic tools in just a few hours. How’s that for making it easier to get organized?! I swear, the hardest room to organize is the craft room! Who’s with me??? There are so many little parts, and you never want to toss anything out because it will come in handy someday. But an organized craft room will make crafting much more enjoyable and easy, so lets make this the year it gets cleaned! 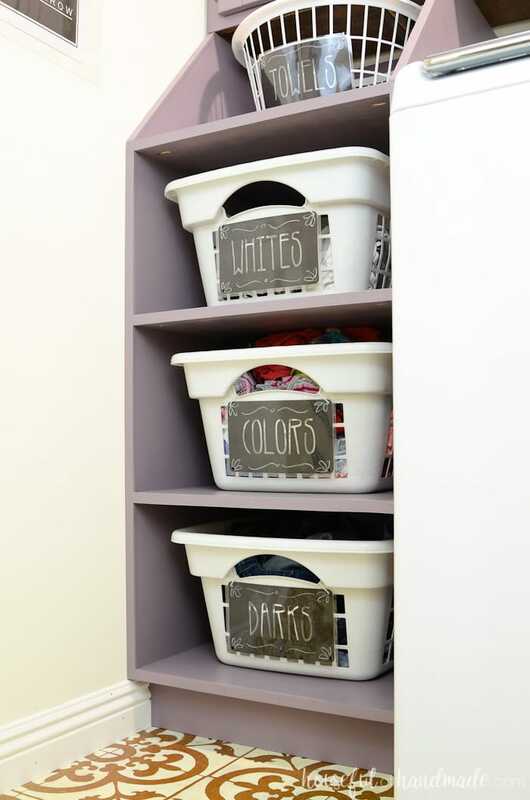 All these ideas are great for organizing on a budget! They are all part of our $100 office and craft room makeover. Love to paint? 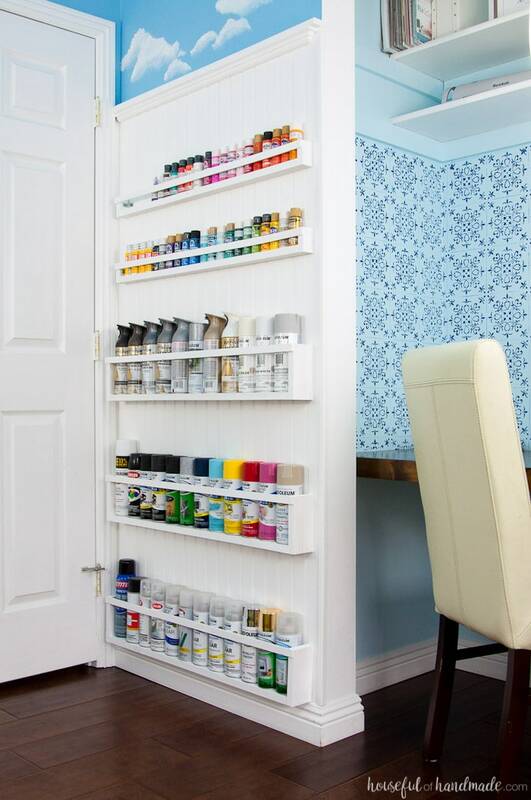 Whether your paint addiction is to spray paint or craft paint, these paint storage shelves are perfect for you! Turn the unused space behind your door into an organized wall for all those little cans or jars. These easy shelves can be made in minutes but you will love them forever. 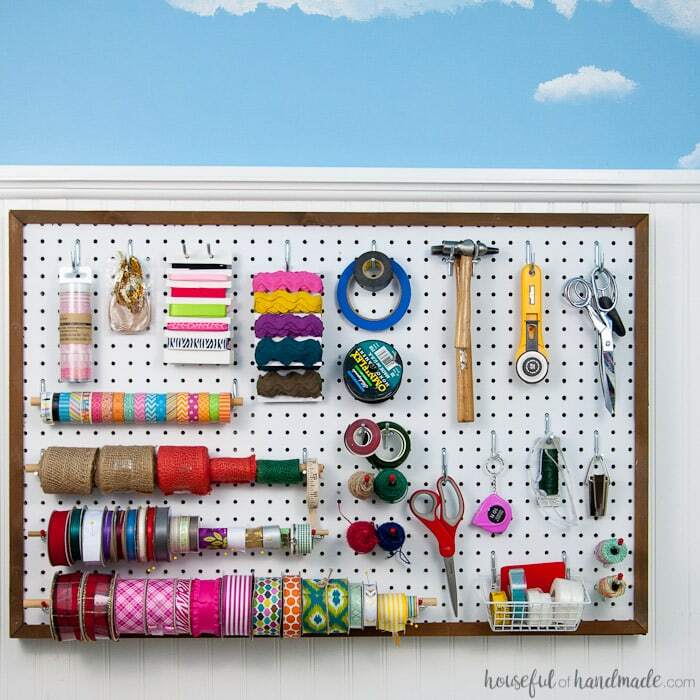 Most people think of using pegboard in the garage, but it is so wonderful for the craft room too! This craft room pegboard holds lots of ribbons, washi tape, and all the frequently used crafting tools. But the best part is I show you how to make a pegboard that is removable. That way you can take your amazing storage wherever you go! Labels are an organizers best friend! But the best type of labels are ones that can be changed out as needed. You will never guess what these easy chalkboard labels are made from. 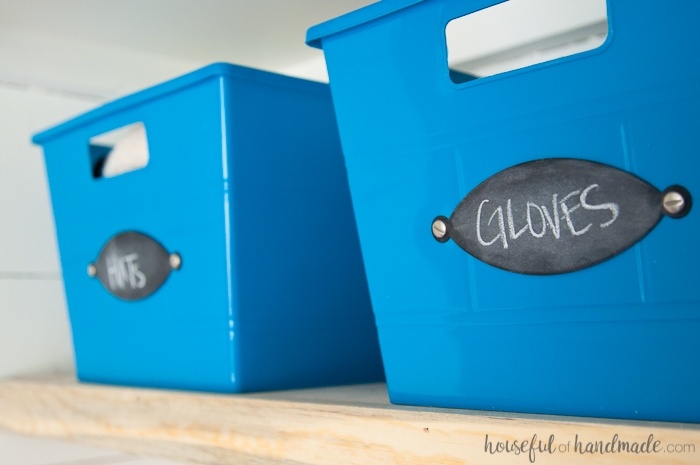 They can be affixed to any bins, buckets or boxes to help you stay organized! Any mom will tell you how much they hate keeping the toys cleaned and organized. But what if you could make something to help out? 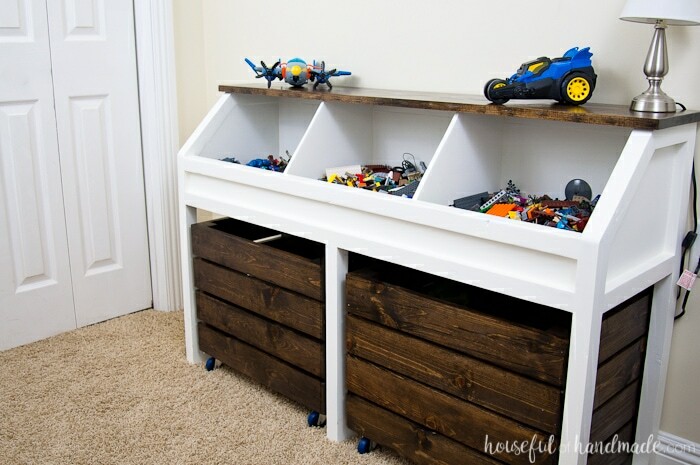 Well these toy storage and organization DIYs might just be what you are looking for. I know they have helped us out a lot! Would you believe me if I told you that 2 years later, my son still keeps his toys mostly cleaned up because of this wonderful toy storage unit? Its not a lie! We love this rustic toy console because the toys are easily accessible, but even easy to put away. And it really looks amazing, doesn’t it? 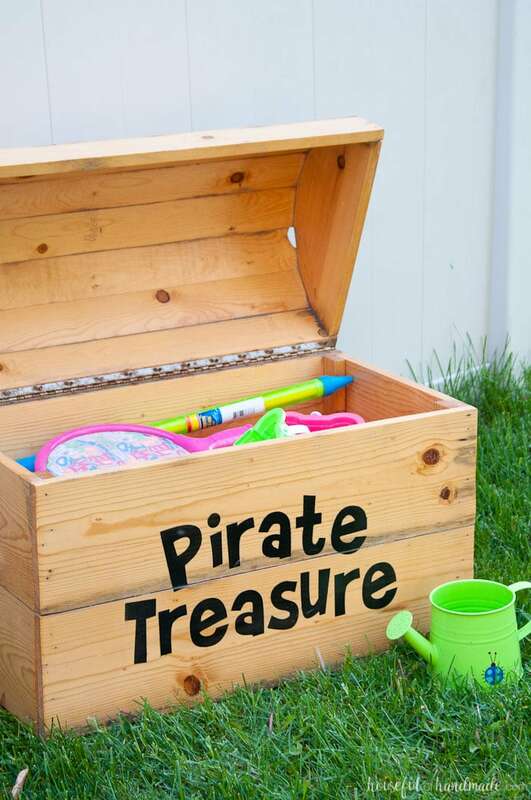 This treasure chest toy box is our way of keeping the kids outdoor toys from cluttering up the yard. We love having a home for all the balls and sprinklers. And the kids love having a treasure chest for imaginative play. But you could also use this as an indoor toy box. How amazing would this be in a playroom with a pirate or ocean theme?! You cannot talk about organizing your home without ways to organize the family too! As our kids have grown, we learned how important it is to have a place to keep everything together. So many activities, events, and more! With each kids come even more to track. 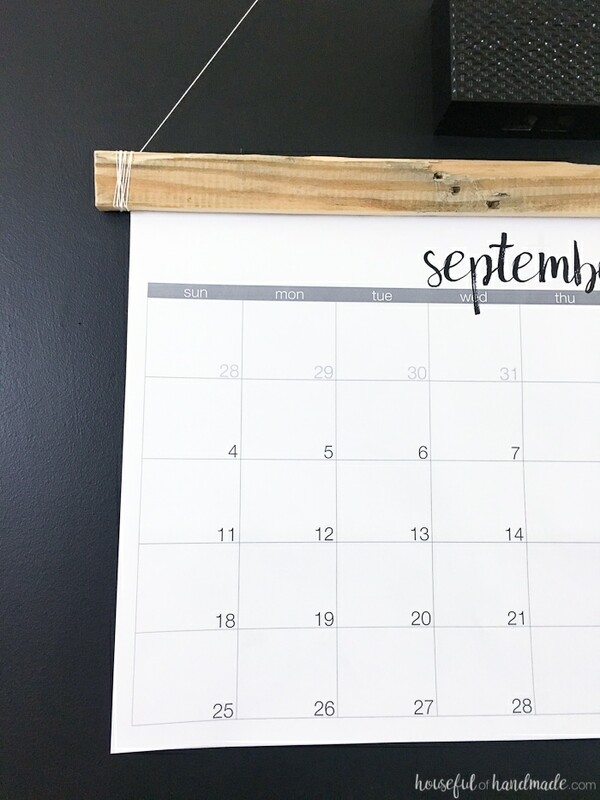 We have room for it all and more with this printable giant wall calendar! We printed it on 24″ x 36″ blueprint paper and attached it to a piece of wood. Now we have one place to track everywhere the family will be! No room for a command center? How about adding it to your hallway! A hallway command center is a great way to keep track of everything. Clipboards hold the kids important papers and chore charts. The calendar tracks our every movement. And there is even a place for our weekly menu. 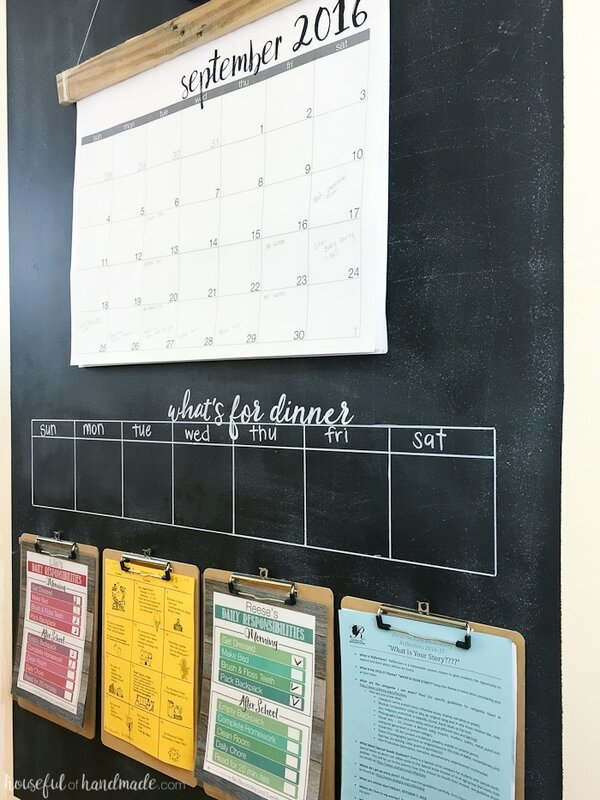 The newest DIY on the blog couldn’t be left off the list because it is my favorite new way to stay organized. Since our entryway closet it only big enough for 3 season’s of the year, when winter comes all the snow gear ends up in a pile on the floor. 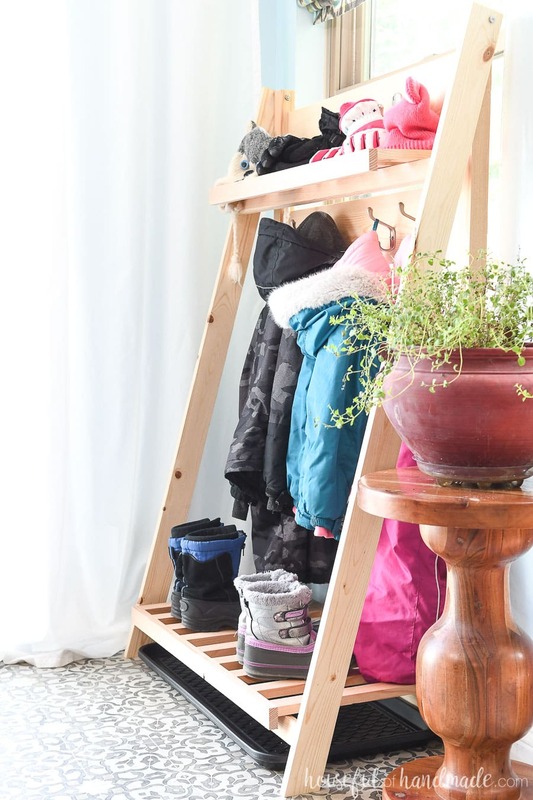 These collapsible storage shelves are like a temporary mudroom! They can be set up when we need the extra storage space, but then fold completely flat when not needed anymore. Now you are armed with everything you need to organize your home this year! Lots of great ideas! I really love the fabric, and drop cloth boxes. I saved a couple that I plan to upcycle just haven’t gotten around to it yet. I have a pile of boxes for upcycling bigger than I probably need. Ha ha!